Until now, with some notable exceptions, most large institutions of higher learning with strong online offerings have been for-profit entities like the University of Phoenix. Most nonprofit public and private colleges and universities have continued to focus on their campus programs with little enthusiasm for the idea of launching online counterparts. Change comes hard to some entities, but the pressure applied by falling enrollments is likely to cause these institutions to take another look at what online learning can do for them. As they do, they will be faced with a major decision: How do they enter into the unknown? Do they brave it alone, learning as they go? Do they look for someone who can do it for them? Or something in between? For such institutions, the temptation to sign with an online program manager (OPM) must be almost irresistible. OPMs are organizations that provide everything needed to launch and manage a successful online program, including the up-front funding. In return, they receive a substantial share of the revenues for a stated period of time. Perfect, right? Not exactly. Over the past few years I have spoken with many institutions who opted to sign an OPM contract — and have since come to rue that decision. Most revenue-sharing contracts specify that the OPM will receive 50%–70% of the revenues. The organizations I’ve spoken to feel, in retrospect, that this percentage is simply too large. This kind of split may have made sense back in the dark ages of early online learning, but it is our belief at ExtensionEngine that it’s no longer appropriate for most schools. Schools work hard to build their reputation, their brand, and their intellectual capital. Handing over most of the fruits of their long-term work to a vendor whose role is to “merely” move it to an online environment seems excessive. Plus, there’s the irony — and frustration — of having the revenues they expected to generate by going online end up in someone else’s bank account. At ExtensionEngine, our contracting and relationship model is quite simple in concept: You pay us, and we work; you stop paying us, and we stop working. 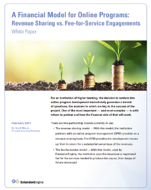 Many schools could live with high revenue-sharing terms for a short time; after all, the arrangement facilitates the launch of their programs. But most commitments are longer-term: five to ten years. This, according to the schools I’ve talked to, is far too long. There are a couple of problems with these contracts. The first is how long it takes for the institution to realize the full promise of online learning as a source of new revenues. The second is that no one can really predict what the online learning world will be like in five years, let alone ten. Making a commitment for that length of time seems unacceptably risky in a world that is changing so fast. At ExtensionEngine, we have monthly contracts. If both parties are happy, we keep working together; if not, or if we’ve achieved the institution’s goals, we can go our separate ways. Faculty want to teach in programs that they can be proud of, that they can get satisfaction from, and that they know to be effective. At the institutions I’ve spoken with, the faculty experience with the typical OPM engagement is just the opposite. Faculty feel like they don’t own the program and that they, as teachers, are being forced into preexisting boxes built by someone else. Not only is this unacceptable to most faculty, they will actively fight it. The key to gaining faculty support is to work with them to ensure their concerns are addressed and their goals as teachers and mentors are met. It’s helpful to find a partner who can help generate the necessary momentum, buy-in, and strategy — and to educate the faculty on what is currently possible in online learning. Advances in pedagogy (and the underlying technology that supports it) enable effective learning experiences that could only be imagined a few years ago. Creating these learning experiences can be highly satisfying to faculty, as can the results they see from students who engage with them. We know such faculty enthusiasm for online learning is possible because we’ve seen it. Every school, every program, and every faculty is different, but if everyone keeps an open mind and is willing to experiment, then success is achievable.